Shower gels named after famous warriors? Well…okay, but why can’t we use another type of person to promote products, a type that didn’t thrive on warfare, a type that doesn’t make me feel so “adolescent” as I buy a WARRIOR shower gel? I’d even risk appearing pretentious over appearing adolescent, so maybe I’ll develop a Poet Series of scented products myself: Haiku (Bashō) bath gel fragranced with pine needles, lotus, green tea leaf, kyara wood, smoke and bamboo, or a Leaves of Grass candle (Whitman) with sap, lilac, birch, cumin and musk. What about a fragrance honoring a poetess: Marianne Moore; she liked apricots and baseball, so osmanthus and ‘baseball glove leather’ would do the trick for Tricorne Eau de Parfum. 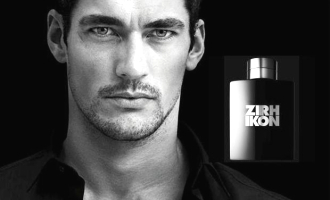 Men’s skincare company Zirh has just released Ikon, a fragrance developed by perfumer Frank Voelkl. After reading Ikon’s ingredients list (davana flower, lemon, ginger, cardamom, black cinnamon, clove, iris, frankincense, labdanum, cedar, amber, vetiver and patchouli), I felt I didn’t need my crystal ball to know which notes would dominate the composition: there would be some ‘lemon’ (generic citrus), cardamom, and lots of cedar and amber. I’ve given up on mainstream fragrances presenting a bold patchouli note, a vibrant, expensive-smelling frankincense aroma, or a gutsy dose of labdanum; davana blossom essence is pricey, so I didn’t expect to detect it (and didn’t) in a $50 Eau de Toilette.